Foliar sprays are useful for delivering fertilizers, fungicides, pesticides and PGR’s to plants. 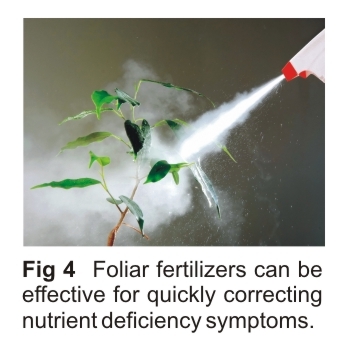 Foliar sprays can be broadly categorized as either “systemic” or “non-systemic”. “Systemic” spays are absorbed into the plant via ‘stomata’ and then transported via the vascular system to where they are needed (Fig 1). Foliar fertilizers, PGR’s and many fungicides are common examples of systemic sprays. 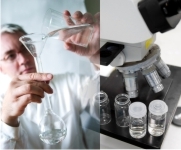 “Non-systemic” sprays are used to treat problems located on the surface of the leaf. Most pesticides are non-systemic. Fungicides used to treat certain types of “surface” fungi such as mildews are also usually non-systemic. A wetting agent (or ‘wetter’) should always be added to foliar spray solutions. 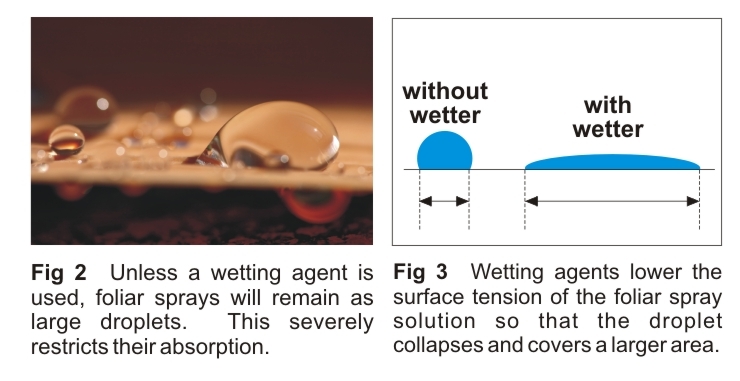 Wetters are a plant specific surfactant that improve a spray’s capacity to “wet” and penetrate foliage. 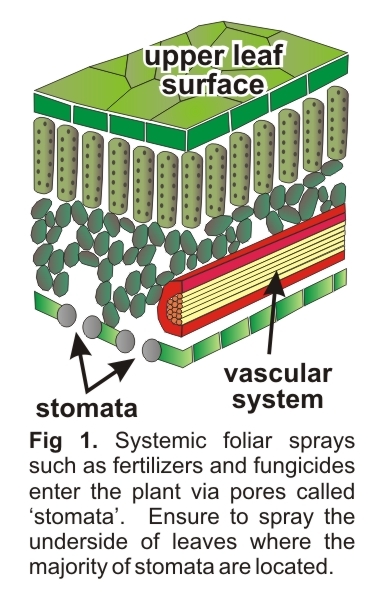 Where systemic sprays are being used, the spray is able to cover and enter more stomata. This increases the opportunity for absorption (Fig 2 & 3). An improper wetting agent can cause problems such as foliar toxicity symptoms and prevent the foliar spray from entering the stomata. In the absence of a wetter, large droplets will form on the leaves. These will either roll off the leaf quickly and be wasted, or may cause burning when intense light is present. 4. The spray device should be fitted with nozzles that produce a fine mist. This helps maximize surface coverage, especially on the underside of leaves where the majority of stomata are located. This is also important for non-systemic sprays such as pesticides because insects tend to harbour on the underside of foliage. 5. Spray when wind is minimal. This is especially important with finely atomized sprays because they drift readily. If growing indoors ensure oscillating fans and ventilation units are switched off. 6. Only lightly spray the leaves and stems with a thin film of moisture. There should be little or no run-off. Drenching the surface of the foliage is wasteful and can restrict the stomata’s ability to absorb. 7. Use low salinity/ soft water. This will reduce the risk of leaf staining and burning. 8. Where growing outdoors, delay spraying if rain is imminent. If rainfall occurs within 1 hour of spraying, re-spray within the next 1-2 days. For more see page 69 of the FloraMax Hydroponics Manual.